Evaluation is an important part of the policy cycle. Evaluation contributes to policy learning through the utilisation of evaluation results in improving the design, quality and implementation of the policy in question. Evaluation results can also help policy makers to target available resources more effectively and efficiently. Evaluation enables the demonstration of policy achievements in a transparent way through the collection of evidence on the performance, effectiveness, efficiency, results and impacts of policy interventions. These are important means to justify the funds spent and to enhance the transparency and accountability of EU rural development policy for stakeholders and taxpayers. The validation of policy achievements serves to legitimise funding for rural development measures, and is important at European, national and regional levels. T​he 2014-2020 programming period has brought important changes to the Common Monitoring and Evaluation System (CMES) for rural development policy. Moreover, for the first time a Common Monitoring and Evaluation Framework (CMEF) was set up for the whole CAP, i.e. both pillar I (direct payments and market measures) and pillar II (rural development). Standard annual reporting will begin in 2016 for RDPs, and continue each year, providing information on programme implementation, the progress in evaluation activities, as well as any other issues affecting RDP performance. 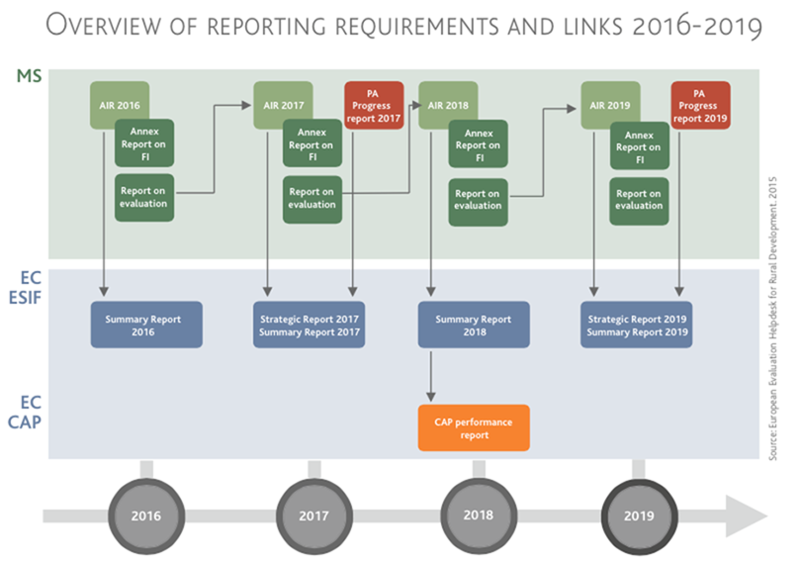 In 2017 and 2019, the Managing Authorities will submit enhanced Annual Implementation Reports (AIR), which will contain evaluation findings, such as the quantification of programme achievements, answers to evaluation questions and (in 2019) the progress towards EU 2020 strategy objectives. These reports will serve as an intrinsic information source for relevant stakeholders, as well as for the European Commission, the European Parliament, the Council, and the European Court of Auditors, to achieve a result-oriented approach to future policy decision-making.